Greetings PCEP Partners! Pacific Resources for Education and Learning (PREL) is happy to present the April/May bi-monthly PCEP Newsletter Update. The reports in this update illustrate PCEP’s ongoing support to schools and communities adapting to climate impacts in their local places. The first report features teacher training workshops in Hawaiʻi, focused on global change to teach core STEM. The second highlights collaborating and sharing lessons learned while working with indigenous communities, spotlighting case studies in Kosrae, the Commonwealth of the Northern Mariana Islands (CNMI), and Alaska. Each article demonstrates how specific PCEP resources and partnerships support climate education in the region. Lastly, we are proud to share professional development opportunities for educators coming up this summer! Also keep an eye on our web portal, where we have several new resources added since the last update. For any comments or questions, please send to Canita (rilometoc@prel.org). 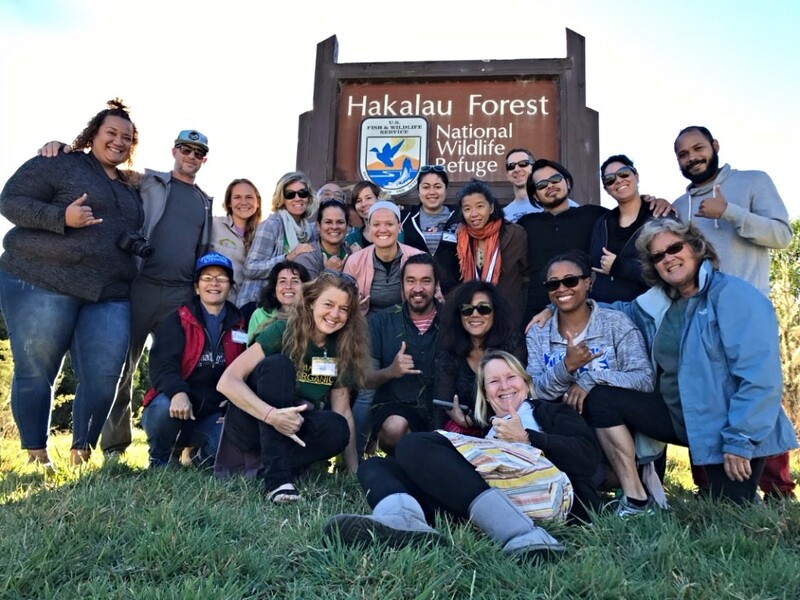 The Teaching Change program (http://www.teaching-change.org/) recently ran its 3rd annual Teacher Training Workshop on March 9–11, 2017 at Hakalau Forest National Wildlife Refuge and the Institute of Pacific Islands Forestry. These annual workshops integrate a teacher education and curriculum development component into our existing youth education program in natural resource management that is focused on place-based, outdoor, immersive, experiential youth education. 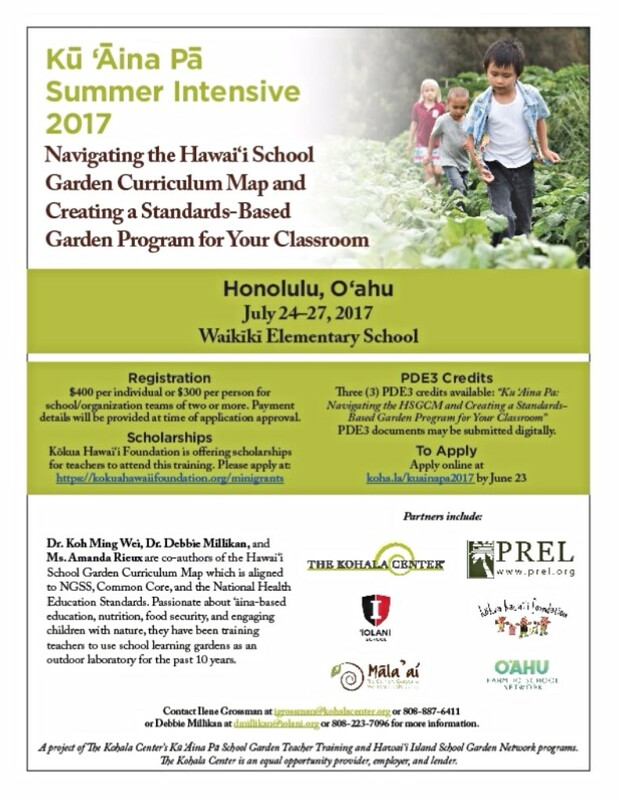 The overall goal of these workshops is to provide secondary school Science, and Career and Technical Education teachers from Hawaiʻi with the background and knowledge to develop and implement immersive curricula focused on global change (i.e., climate change, invasive species, and land-use change) using phenology (the timing of life cycle events) of native trees to teach core STEM concepts aligned with Next Generation Science Standards. The Climate Change Education Partnership (CCEP) Alliance developed a webinar series in 2017 to compliment the newly released Climate Change Education: Effective Practices for Working with Educators, Scientists, Decision Makers, and the Public guide. 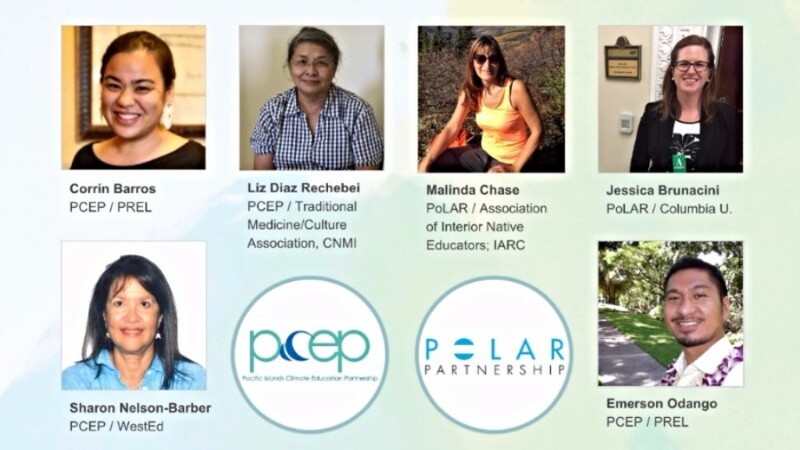 PCEP and one of our Alliance-partners—Polar Learning and Responding (PoLAR) Climate Change Education Partnership—gave a joint presentation on Monday, May 15, 2017 focusing on Working with Indigenous Communities. The PCEP presenters were Corrin Barros and Dr. Emerson Odango (PREL), Dr. Sharon Nelson-Barber (WestEd), and Elizabeth Rechebei (Commission on Education in Micronesia). The PoLAR presenters were Jessica Brunacini (Columbia University) and Malinda Chase (Association of Interior Native Educators). The overarching goal was for both projects to share stories and contextualizations about the “Working with Indigenous Communities” chapter in the Effective Practices guide. The PCEP presenters discussed relationship-building as one of the major lessons learned during the project. We shared perspectives from the contexts of the case studies features in the guide: Kosrae and the Commonwealth of the Northern Mariana Islands (CNMI). In Kosrae, we learned that building relationships to support climate change education requires acknowledging that such relationships can change, they involve taking risks, and they are reciprocal. In the CNMI, we see relationships grounded in Indigenous, local ethics: land & interdependence, spirit & sustainability, and culture & biocultural diversity. Our PoLAR colleagues presented on the outcomes and lessons learned from a climate change camp that took place in Fairbanks, Alaska. Among the various takeaways, one that resonates with our PCEP presentation is their realization that collaborative relationships with Indigenous communities take time to build and maintain. This webinar was an important opportunity to demonstrate the value of sharing cross-cultural lessons in climate education projects that work in partnership with various Indigenous communities. As mentioned in the above update about the Working with Indigenous Communities presentation, there is a CCEP Alliance webinar series. The first three have already taken place: Working in Informal Environments, Working with Indigenous Communities, and Working with Key Influentials. The fourth and final webinar is titled Working with Formal K–14 Educators. PCEP Staff Corrin Barros and Dr. Emerson Odango are co-presenting in the Formal K–14 Educator webinar. Please see this CCEP Alliance website for more information about the series, recordings of completed webinars, and how to register for future webinars. Since the last update, we have added two more new resources to the PCEP web portal Resources page at pcep.prel.org/resources/. Coral Reefs—Underwater World in a Changing Climate is an odyssey into a world just below the ocean surface, bursting with colorful coral colonies, giant schools of fish, graceful turtles and sharks, tiny microorganisms, and more; and Agroforests—Growing Resilient Communities takes readers of all ages on an exploration among the trees and other plants that shape the life and cultures of our Pacific islands. Copyright © 2017 Pacific islands Climate Education Partnership, all rights reserved.